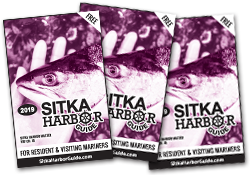 The cover image for the Harbor Guide this year is courtesy of John Erp, a Sitka-based photographer, sailor and troller. We reached Erp as he was rigging his trolling poles on one of his two vessels at the work float this spring. He lives on one vessel or the other. 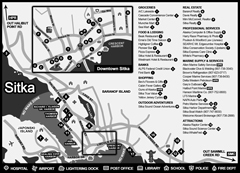 Erp said the cover photo – which he has not named — was of an older wooden sailboat moored in downtown Juneau circa 2000. Erp, now 65, had just completed an intensive summer program at the Rocky Mountain School of Photography. “What caught my attention was all the converging angles of the bow spit, chain and lines,” Erp said. It might be appropriate that Mark Bartlett paints the Rockwell Lighthouse, because light is one of his main sources of creativity. “I’m always seeking light,” the 52-year-old Sitka-based artist said. “That’s what I’m looking for and where I start a painting. Cover artist Sandra Greba’s “No Vacancy” displays the vivid colors and sharp line that makes this watercolorist unusual for her medium. Watercolor paintings often use soft hues and soft lines. Soft would not begin to describe the strong red that dominates this work. Greba is an Alaska-born, self-taught, Sitka-based artist who specializes in paintings of birds and flowers, but who occasionally takes on a different subject. She said she was inspired to paint “No Vacancy” from her experiences in Southeast viewing sea lions who have hauled themselves onto buoys to bask in the sun. She admits taking a little “artistic license” and packing in as many sea lions as she could.